Are fritters a breakfast, lunch, dinner, or snack type of recipe? What’s your vote? As I was categorizing this post I realized I would eat them at all four times. 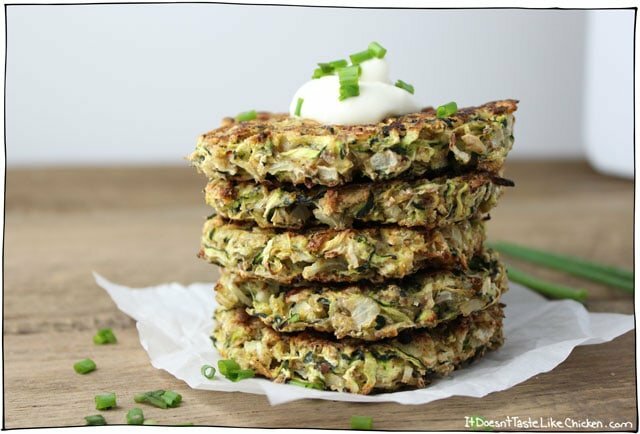 For a savoury breakfast, these Baked Vegan Zucchini Fritters served with a dollop of sour cream, a side of apple sauce, some home fries and a light salad would be just divine. For lunch I could see them served along side a bowl of tomato soup and maybe a light salad here as well (I love salad)! For dinner, with Creamy Coconut Garlic Mushrooms, and some mashed potatoes. For a snack, I just pick one up and eat it cold, no utensils needed. You could even layer these into a sandwich or use as salad topper. So many scrumptious options. 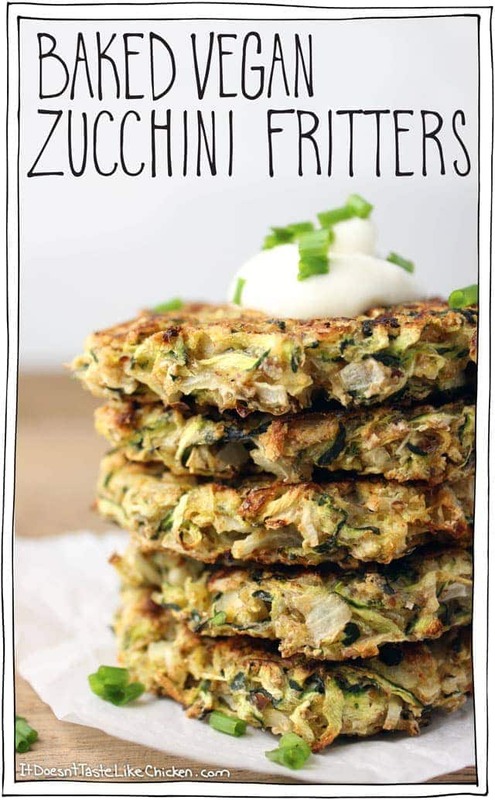 So why does my recipe make only 6 zucchini fritters? Because I’m a damn fool that’s why. I would make another batch right away but I am out of zucchini. Boo-urns. So you are welcome to double this recipe if you like. These are definitely going to be a new regular for me. Light, healthy, easy to pull together, fancy looking, fancy tasting, all the fancy things I like in a recipe. I think I will make them in larger batches and even try freezing some. Quick fancy brunch, here I come!! So fancy. Side note: I said it too many times! The word fancy is starting to not sound like a real word anymore. I hate it when that happens! 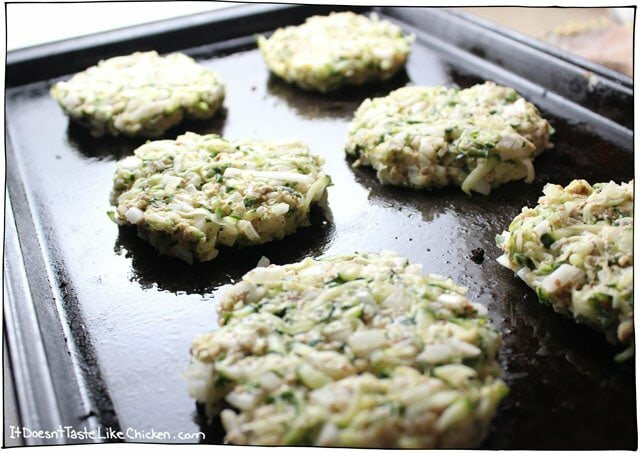 To make these fritters into fritters, and not soggy blobs of zucchini, you will first need to grate the zucchini. 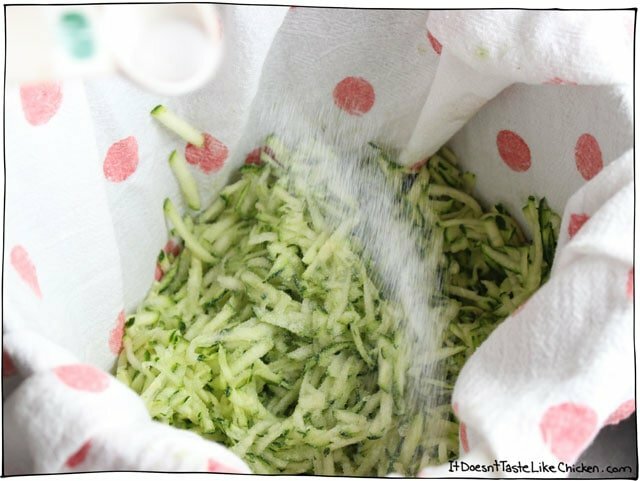 Then line a bowl with a clean dish towel, and fill with the grated zucchini. Sprinkle with magic fairy dust… or salt, whatever you call it. Toss, and then let rest for 10 minutes. The salt will help pull the water out of the zucchini. Then you just gather up the sides of the cloth, so that the zucchini is trapped inside, then squeeze the zucchini so that water is released. Do this for a minute or two so most of the water comes out. You will never get ALL the water out, zucchini is 95% water!! So don’t even try. Just get the excess out. Now add the zucchini to a bowl along with onion, garlic, whole wheat flour, nutritional yeast, and flax, and mix to combine. Form your patties and bake for 20-25 minutes flipping once midway through, until golden on both sides and cooked through. Top with a dollop of vegan sour cream, some fresh chives, a crack of pepper, or however you like. I love this whole food plant based recipe. You can serve it for brunch, lunch, dinner, or even as a snack! Preheat your oven to 400F (200C). Lightly grease a baking sheet. 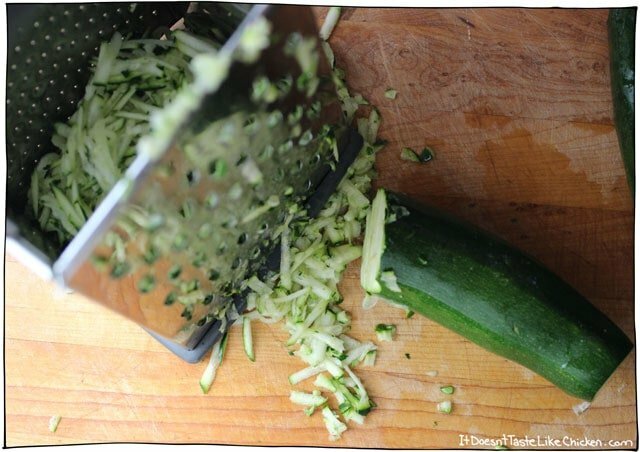 Line a large strainer with a clean dishcloth and fill with the grated zucchini. Sprinkle the salt over the zucchini then lightly toss the zucchini to coat. Let rest for 10 minutes. Gather all ends of the dishcloth so that the zucchini is trapped inside, now squeeze the zucchini, squishing out the water. Squeezed out as much water as possible. In a small bowl mix together the flax and warm water. Set that aside. 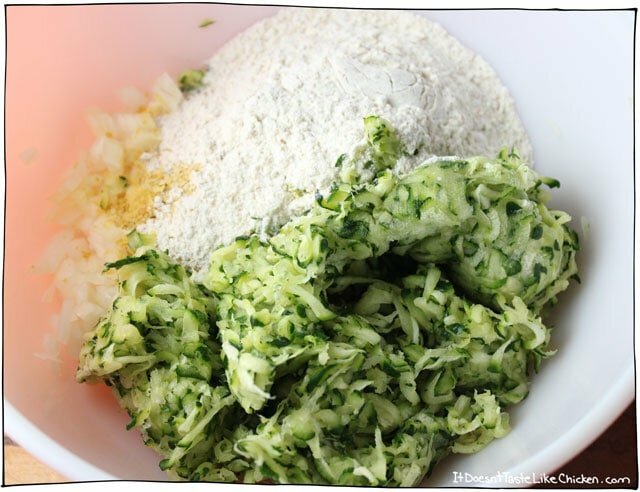 In a large bowl mix together the squeezed zucchini, onion, flour, nutritional yeast, flax mixture, and garlic. Mix well. Scoop up enough for one fritter in your hands, and form a patty. The dough will be quite sticky. Spread them out on your baking sheet. If they are a little messy you can tidy them up by wetting your hands and patting them into shape. Bake for 20-25 minutes, flipping them once midway through. They are ready when both sides are nicely browned and they are cooked through. Serve hot or cold with a dollop of vegan sour cream, or your favourite dipping sauce. * These fritters are pretty moist on the inside, so if that’s not your thing, you might not like this recipe. If you still want to try it but would like them dryer, you could try making mini versions to help them get dryer through out. I also found that if you leave them out overnight they dry out a bit more too. Featured Ingredient: Zucchini. 46 Recipes 82 Days to go! I subbed almond flour for the wheat flour as I need to be gluten free right now. These were fabulous! I followed advice I read in the comments: I used a potato ricer to squeeze the zucchini, and broiled both sides after baking. My husband said only 3 words as he inhaled them, “Make these again.” I’ve never posted a comment before but my 8 and 9 year olds insisted. Served with a salad and enjoyed by all. You could for sure fry them. Just make sure to keep the heat low so they cook all the way through. Enjoy! This recipe comes out to be amazing awesomeness. Even my Non-Vegan family members are fighting over who gets the next one. Thank you for this recipe! My boyfriend and I enjoyed them immensely. I made a few modifications. I used yellow zucchini squash and red onion because thats what I had. I also used mostly chickpea flour and a bit of whole wheat flour. It was delicious! I will definitely make them again. Will it work without the flax? You can’t get it where I live. Made these for lunch… we made 10 instead of 6… mom/husband and I finished them all. Lathered in some no-oil hummus. This recipe has failed for me now three times. This round I’m now out 3 fresh garden zucchini. I wish there was a way to flag this so I’d quit trying it. 🙁 It’s been a year since my last attempt (I forgot it was this recipe I had tried) and now I remember that that time, they also completely stuck to the pan AND they never firmed up AND they were soupy and I couldn’t flip them. 🙁 I’m so bummed. I’d been saving those zucchini for a special occasion and this was it and now they’re gone. So sorry to hear the recipe didn’t work for you, Julie! It sounds like perhaps not enough liquid was squeezed out.The patties have to be really dry. It’s a recipe many readers make often and it always works for me as well… wish I could be more help! Yeah, mine came out soupy, too. I will dry out the zucchini WAY better next time and give it another go because the flavor was great, but the texture was not. =( However, I’ve also never made a fritter of any kind before sooooo…..try try again! This recipe sounds delicious and I can’t wait to try it! I’m not vegan so would 1 egg be substitute for ground flax seed and water? I made it tonight and it was delicious. Can you bake them and freeze them?? So happy you enjoyed them! Yes, I think they would freeze just fine. Great recipe by the way! Having it for dinner tonight! Thanks for sharing! The recipe was great. The thing I did different was I used my juicer to take out all the moisture and they were nice and crispy. You can use this technique with almost anything you juice and make fritters from the leftover pulp. I just made these with yellow squash and YUM!! San, you were right. Need to at least double this recipe to extend the deliciousness! This is one of those recipes that can be easily changed with adding a spice or hot pepper. Oh cool! Doesn’t that turn them to mush tho? Or does it just mush out the water? I tried this tonight (did them on the barbecue on a cookie sheet so as not to heat up the whole house) and they turned out fabulous. I added a bit of thai sauce, but followed the recipe other than that. Loved them. I was fortunate enough to have a very good friend make these for me! And they were delicious! Thank you for this recipe, I will be making it very soon myself! This would be wonderful to serve to friends too, with hot sauce or if I could find a no oil Buffalo sauce that would be good on this too! Do you care if I share it in my Private Facebook Group? It’s called McDougall Friends Facebook Group. It’s for those of us following Dr. McDougall’s WOE plant based with no added oil. Any suggestions for gluten free flour? 1st time going vegan. Used Napolina, apples, yellow pepper & coconut oil as binding base. Added jalapeños, carrots & onions. Baked in oven as small bite size patties. Delish!! Will definitely make again soon, but next time a double batch!! So very happy I am reeling you in. I just made these and they are simply delicious. I adjusted the recipe a bit: 3 large zukes, 1/2 diced green bell pepper, 1 Tbsp hulled sesame seeds, 1 Tbsp chia seeds, 1/4 cup raw sunflower seeds, 3/4 cup of gluten free all purpose flower (adjust per wet zukes) and 1/4 tsp black pepper. I was concerned they would be soggy, so I made the patties no more than 2″ in diameter and only 1/2″ thick. I got out a big metal pizza pan and covered with parchment paper. Lightly brushed the paper with olive oil and placed the patties on them and then lightly brushed the tops of the patties. Cooked these at 380 degrees for about 30 minutes on each side. My home smells very green right now and the sunflower seeds were toasting – mmmmm. I ate 1/3 of these and and had to put the rest away. I did squeeze the water out of the zucchini A LOT and with them being so small, they were crunchy on the outside and delicious on the inside and not a soggy blob. I only recently found your blog, and I have been preparing to make pretty much all of your recipes at this point, but it all started here! The only vegetable I had left was zucchini a few nights ago so I searched for an easy recipe to use them in, and I landed over here. They were so so good! These babies will forever be on my go-to list for quick and delicious meals, and I think I am going to make mini fritters for my a party tomorrow night to get some non-vegan opinions 😉 I’m sure they will be a hit! Hey there, the flavor was great but texture not so good gummy, stuck to pan, and never browned. What temperature do you cook them at and you never mentioned greasing the baking pan. Remember newbie chefs such as my husband who attempted these might be trying to follow your recipes. Follow up: I tested the recipe again, and it turned out great for me. These fritters are pretty moist on the inside, so if that’s not your thing, you could try making mini versions to help them get dryer through out. I also found that if you leave them out overnight they dry out a bit more too. I have brewers yeast from making lactation cookies. Can I substitute it in place of nutritional yeast? I think that should work fine, nutritional yeast is slightly nuttier in flavour, so the recipe may taste a little different but it should be ok. I made these last night for the first time – OH MAN so good! Thank you for sharing all the yummy!! Holy.Crap. I was expecting to like this fritter ok. But then I made a sauce to dip them in and I’m suddenly head over heels for these fritters. This recipe is going into weekly rotation effective immediately! Haha! That’s awesome!! I’m so happy you liked the fritters so much Monique! What sauce did you make? I made a sauce I got from a recipe for salmon cakes….tastes like spicy yum yum! I doubled up on the recipe and am so glad I did! Heading to the store after work to buy more zucchini and onion to make these for tonight!! I’m curious if you tried to freeze them? And if you did, did you cook them first? I haven’t tried to freeze them because I have a teeny tiny freezer (and I also tend to eat the entire pan in one go) haha. I think they would freeze well once cooked. Then you could spread them out on a baking tray, and bake at a lower temperature until hot and crisp again. If you give it a try, let us know how it works out for you. Making them now. Had to throw away a whole tray because they wouldn’t brown and. Couldn’t be released from parchment lined tray. Made a triple batch and fried them. Then they were great! Hmmmm I am wondering if my oven temperature was off when I wrote this recipe… Although I see it worked for some people. So happy you were able to fry them and rescue them! Sorry to burst everyone’s bubble but I made these and they were AWFUL. Followed the recipe exactly but substituted all-purpose flour for the whole wheat flour. Grated the zucchini and squished the water out using a kitchen towel. Placed the patties on parchment paper to bake. They came out soft and gummy, even baked them a little longer because they never really browned. I ended up throwing the whole batch in the garbage. Maybe they didn’t turn out well because I live in Denver-(high altitude?) or that I used pre-ground flax seed instead of grinding them from whole seed. Any suggestions? I really wanted to like this recipe as I have an abundant crop of zucchini. Awww that’s such a bummer! I’m sorry the recipe didn’t work out for you Sherrie. Do you think that perhaps your oven is a little cool? I bought an oven thermometer to use in my oven, because I find ovens are often not accurate. 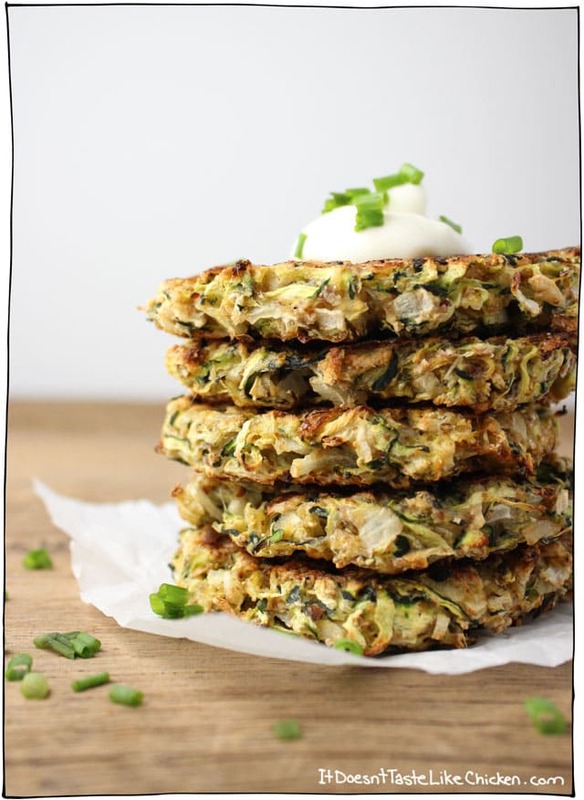 You said your zucchini fritters never really browned, which is what makes them a great texture, so thats why I am wondering about that. I don’t think the flax would be the issue because that is to holds them together. If they held together fine, then it shouldn’t be the problem. I’m glad you like the website name! I hope this doesn’t deter you from trying more recipes in the future! These sound delicious and easy but I do not have a proper oven…only a toaster oven. Would they cook properly in that? I have a garden with an excess of zucchini and am always looking for more recipes to use them. I’m going to try your recipe and let you know if it works. I don’t actually have a toaster oven, so I am afraid I don’t have much experience with them. If you give it a try, let us know how it turns out, and if you have any toaster oven baking tips! Ah, yeah doesn’t sound like the toasted oven worked well. Better stick to an oven or frying next time. Thanks for the advice! I came across your site because I am trying to find something to make for my 1 year old that does not have eggs in it (due to possible allergens, didn’t get tested though and really don’t want to go through that). What is Nutritional Yeast? And will that be something I can omit? Or is it ok for me to give that to my child? Nutritional Yeast is basically inactive brewers yeast. It absorbs a bit of moisture but mostly adds flavor like any spice you put in would. It has a distinctly cheesy taste and is often used by dairy-free people to make cheese sauces and to spice up popcorns, salads, and soups. You could find it online or at any health food store. Hahaha I know what you mean! I can easily have fritter after fritter!! Omnomnom! I hope you and your mum enjoy! I as well am wondering what type of flour to substitute for the wheat flour. Any ideas Sam? Hmmm… gluten free cooking isn’t my specialty yet. I think an gluten free all purpose flour blend, like the one from Bob’s Red Mill would work fine. I would also try oat flour. If you try let me know how these work out for you! Masa harina might work as a flour substitute. Do you have any estimate what the volume of the zucchini shreds were after squeezing out the liquid? I want to try using a mix of zucchini and other veggies but they don’t all have the same water content. Thanks! Hmmm… I don’t really know, but I think using other veggies will work great. I have a recipe for Sweet Potato Pancakes which is very similar. As long as you try to get the majority of water out so that the pancakes will stick together it should work just fine. Enjoy! Thank you for the reply! I will check out the other recipe too, and let you know how it goes. Hi Sam… just found your blog and this was the first recipe I tried. OMG – these are AMAZING!!! And soooooo simple. We absolutely devoured them (hubby, 20 month old daughter and myself). I served with a cashew sour cream – but they really don’t need anything. When I formed the fritters, I slathered my hands with coconut oil to keep the batter from sticking – and a little natural moisturizing never hurts the hands. Thanks for a great recipe – this one is a keeper for sure. I look forward to exploring your blog and recipes. These wee DELICIOUS but they were a little gooey in the middle. What dd you think I did wrong? So happy you enjoyed them! You could have cooked them a little longer to cook all the way through. If they looked like they might get too brown on the outside, you could try making the patties a bit thinner so it’s easier to cook all the way through, or try lowering your oven temperature. All ovens vary slightly. 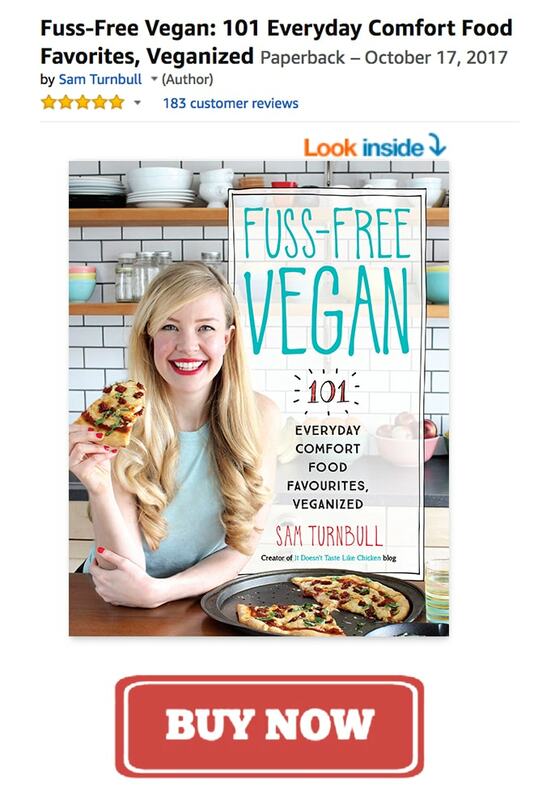 Hi Sam… I just found your vegan blog about a week ago and this is the first recipe I’ve made. I made these tonight – OMG – absolutely amazing flavour. And actually so very easy. I actually oiled my hands a bit with coconut oil before forming the fritters, so that helped with the sticking… and helps to condition/moisturize my hands too! 🙂 My husband LOVED these too. We served with Cashew “sour cream”… but they really don’t need anything. Thanks for the great recipe. I look forward to exploring your site and trying more recipes. Yay! So happy you and your husband loved them! Good idea about oiling your hands. I hope you enjoy more of my recipes to come. Thank you for the lovely comment! Haha, no problem! I am always happy to receive nice comments!! I would eat these morning noon and night, too! Yum, and guess who has some zucchini? Zucchini is a hot commodity these days! Glad I am not the only one who would eat these all day long. I wonder what other delicious foods fit in to that category? Oh my gosh Sam, my mouth is watering! These look fantastic!! 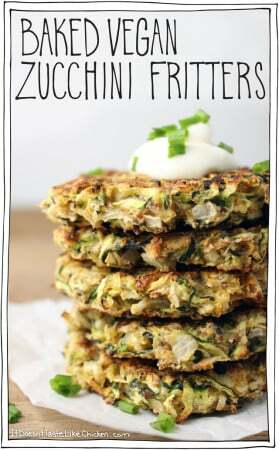 I need to get to the supermarket and buy some zucchini and make these for dinner. I had to rush to the market and get more zucchini! These sound delicious, and I’m definitely going to try them as soon as possible. However, as someone who watches his sodium intake, I need to point out that were you to follow the recipe and use it to make six servings, each would have approximately 404 mg of sodium, since there’s 2,300 mg of sodium in a teaspoon of salt and the other ingredients contribute small amounts as well. Personally, I’d omit the salt completely, but for anyone who wouldn’t, that’s a pretty hefty amount of sodium, along the lines of commercially-prepared foods, and they ought to be aware of it! I think some of the salt would get washed away when you squeeze out the zucchini, but absolutely, omit the salt if you like. If you omit the salt completely, just make sure to give the zucchini a couple extra good squeezes, as the salt helps in pulling the water out of the zucchini. Sounds AMAZING! Do you think oat flour would work as a sub?